We meet to agree the programme of work. Here there are choices to be made around the size of the survey, whether to include different locations and the nature of the analysis required, for example across different sets of demographics such as seniority, function, length of service, etc. This scope must be agreed and signed off by you at the outset of any project. The sample report available for download in the resources section outlines a range of behaviours which are already programmed into an existing survey instrument. These can be changed to whatever degree felt necessary. Typically, some of the behaviours to be reviewed are specific to the organisation under review and it may be that you wish to include other behaviours and exclude some of the existing content. Ultimately it is for the project team to define the scope of the exercise and it is likely that this team already has some clear thoughts on the issues that are most relevant to a high-performing workplace. Specific behaviours that are thought to work against the performance of the company are important but we should also include aspired behaviours and in many instances these may be the opposite behaviours to those felt to be negative. Where possible, contrasting behaviours which could be seen as positive or negative depending on the individual respondent's perspective should also be included, for example, individual effort versus team orientations. The best mechanism for identifying which behaviours to include is to conduct a number of short focus groups with a cross-section of the employee population at which positive and negative behaviours are discussed. When we conduct focus groups, the outputs will be summarised and a set of specific behaviours will be described which might be included in the survey. We will then agree with the project team what is to be included. 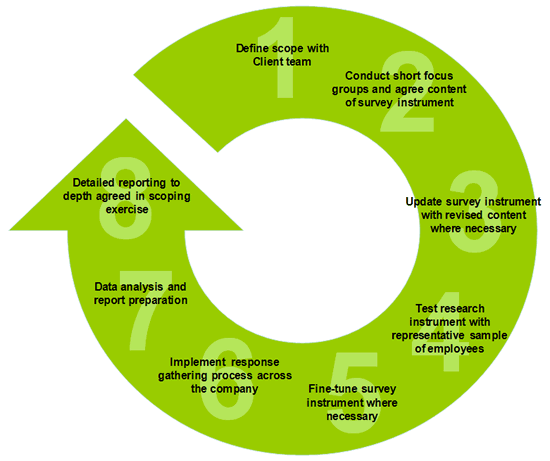 Where required, the survey instrument will be adjusted to reflect the decisions made following the focus groups. The changes can be made relatively easily and we include time to undertake these changes in our overall costings. This is an important step in ensuring that we have constructed a survey instrument that people can understand and easily interact with. We recommend that this testing is completed with 20 people taken at random from across the company. We will then either seek written feedback from these testers or ideally gather them together for an hour to secure immediate feedback. Should any changes be required following this feedback these are made within the project costings. The survey is an on-line process so respondents can complete from anywhere with internet access. One of the primary concerns in a survey like this is anonymity and we will discuss with the your project team the best way of ensuring this. We could, for example, allocate codes to specific email addresses at our end and no staff would then be aware of who was allocated which code. Alternatively, of people were using some form of central PC resource, we can simply allow them to pick a code from a list. We will design a branded web-page for this survey. This will welcome respondents, capture key demographic information and explain the survey process. Respondents will then be taken through a series of screens which will ask them to indicate their choices between two alternatives on a nine-point scale. This is a simple process that should not take more than 30 minutes on average. A mix of the above allows us to present results across a mix of demogrpahics, for example, all Operators with between six and twelve months service in one location versus another or 'Middle Management' between two different functions. While the possible combinations of results are almost endless, we must restrict the analysis to a sensible level, as described below. We will track levels of completions and can prompt responses by email where necessary. You can download a sample report from this site which outlines an overall analysis of a company and an analysis by one demographic, in this case level of seniority. The nature of the analysis will defined at scoping stage but, whatever the scope, the report format will be similar to that demonstrated in the sample report. We will complete the process with a presentation of key points and recommendations and a workshop with you to consider the implications of the results and actions required.